The ML440 Wireless IP DECT handset along with the AP20 Access Point provides the convenience of mobility in the home or office by combining the latest VoIP and DECT communication technologies. The ML440 and AP20 use WiFi friendly DECT 6.0 (1.9 GHz) technology. You can set up either a Single Cell or Multiple Cell solution. The new Wakeup Call feature provides Wakeup Call capability for Motels and Bed & Breakfast establishments. Wakeup Calls are conveniently entered by request from the web-based Wakeup Call Manager at the facility front desk. 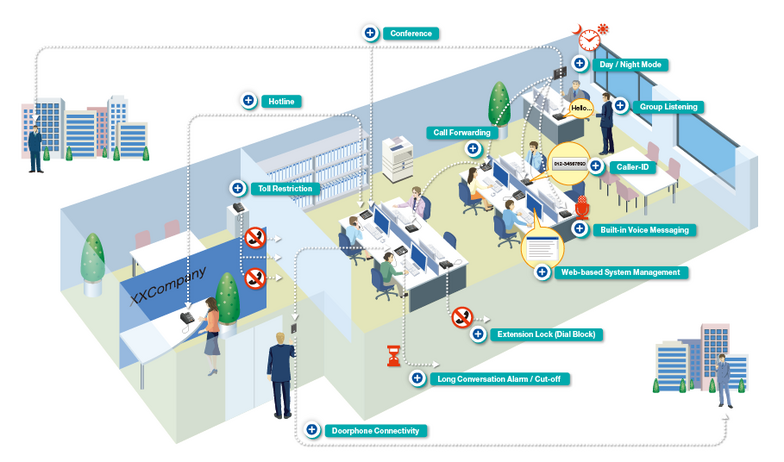 Once a Wakeup Call is set, DSX automatically rings the room telephone at the designated time. When the guest answers, a voice prompt announces the wakeup. If the guest doesn't answer, DSX waits 30 seconds and tries again. If the guest doesn't answer the second call, DSX cancels the wakeup. Enter the room's extension number. Click Save to set the wakeup. Additionally, the Wakeup Call Status section shows the total number of pending wakeups. It also allows the front desk to click an item in the list to cancel it, change the wakeup time, or set a new time for a new guest. Wakeup Call is compatible with the Message Waiting feature at single line telephones. At a Bed and Breakfast establishment, for example, management's DSX keysets can have full IntraMail capability and single line telephones in the guest rooms can be limited to Message Waiting. Wakeup Call will operate normally at either extension type. If the room single line extension has a message waiting from the operator, the guest can lift the handset and dial 0 to return the call. It is no longer necessary for the guest to dial *8. A co-worker leaves a message for Sarah on her office DSX keyset while she is traveling. Email Integration (with the Sync when Read disposition enabled) delivers the email to Sarah's smart phone email client. Sarah opens the email, which causes the message to be saved in the DSX. When the email finishes loading, the Message Status will show that it has been saved. Later on in the day, Sarah calls her mailbox to clean out old messages and deletes the message for which she earlier received a notification. The next time she opens her smart phone email client and reviews her email, the Message Status will show that the voice message has been deleted in the system. DSX Email Synchronization works with all types of email accounts (i.e. client-based and web-based). While not complete two-way synchronization (i.e. the voice mail message status does not affect the email message read/deleted status), this method provides an easy to achieve solution for most users.